Like many a San Franciscan, I do manage to venture out from my own neighborhood enclave to the other, sometimes outer neighborhoods that make up this city. Some are more restaurant food hotbeds than others like The Richmond District. Sure, it is carved down the middle by the monstrosity that is Geary Blvd, but along that main drag and some of the side streets you will find an array of neighborhood mom and pop type shops covering a wide-ish range of food from Korean to Russian to a bunch of other stuff. I'm really out here just killing some time during the day (you know since work is scarce and the act of looking for it is mind numbing) and wandering around to see what is going in this part of town that can so often be chilly and covered in fog. Which, by the way, are some of my favorite weather patterns. Alas, this particular day is part of a warm spell we are seeing which oddly puts me in an outdoor cooking, barbecue kind of mood. What better way to feed that than with a burger and fries! Real summer like day comfort food. 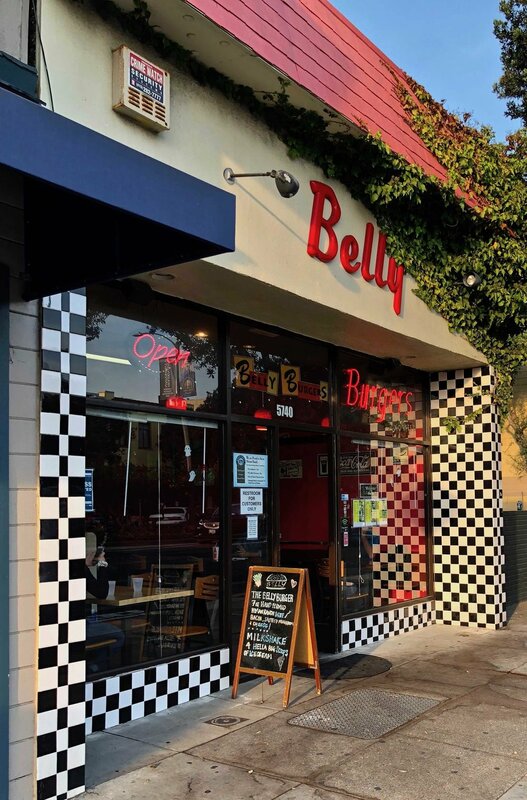 That is what has drawn me to this little spot of a restaurant right on Geary called Belly (though some places have it listed at Belly Burgers, hard to tell what they go by). If you are driving by you could blink and miss it. I'm walking so it has caught my eye and I can scan the menu on the sidewalk. It has sort of a semi old school 50's diner vibe with the checkerboard tiles and red walls. It is just a subtle hint of it as opposed to something in your face like Mel's. The have a neon burger sign in their window and burgers do seemingly dominate the menu, but they do offer other things like fish and chips and fried chicken. Since it is burgers cooking I smell and see on the menu, I'll stick with what seems to be a specialty. After waffling too much time in trying to decide which burger to get, I decided to go a little classic. The bacon cheeseburger which by itself comes in at $7.85. For an additional $3.25 I can add a side of fries and a medium drink (no refills!) for a total of about $12 something with tax. Not bad per se price wise, but still a few bucks more than say Super Duper Burger. It is about a six ounce patty and does come cooked to order medium rare. There was a nice char on the outside though the burger is a bit flattened out to sort of fill up the large bun it is on. This helps to cook it quicker though, even at medium rare, it came off a bit dry. There were some decent sized pieces of bacon, though I'm guessing they were cooked earlier in the day. They weren't crunchy, more of the soft and chewy variety. The bun was standard issue store bought sesame seed and while it was toasted, it could have used some butter to make it a little more special. One thing that was cool here, they have a toppings bar with things like lettuce, tomato, onion, pickles, sprouts and a couple of other pickled type veggies in addition to your standard set of condiment additions. So I will definitely give props for that and the sriracha mayo. Of course, all of these were sitting out without refrigeration which seemed a little sketchy and I did kind of wonder how long has this mayo been open and out? Considering I needed to add the condiments with a heavy hand to offset some dryness issues, I did kind of feel like I was taking a chance. A surprising back patio area to get you away from the hustle and street noise that is a constant on Geary Blvd. There are about four tables, but the area is enclosed and the sound from the front is definitely blocked out. Chalk this spot up as one of those off the beaten track places with outdoor seating. You know how we in SF will take any opportunity or break in the weather to eat outside, no matter where it is. This is one of those times where I am a little torn. The burger was just okay when you compare it to all the other options available around town. And I can't say I thought it was totally worth the price. Maybe if it was a couple bucks cheaper, I might be a little more forgiving, but as is, not so much. Though because they have a nice little add your own toppings bar, a cute back patio area, some tasty fries and are pretty much a mom and pop restaurant, I don't want to totally diss the place. Owning a restaurant in this town is difficult and having a decent enough neighborhood spot can be a challenge. While they wouldn't be my first burger choice, I think in a pinch they'd do. Plus, if you don't want the burger, there is the fried fish or chicken (hopefully not cooked in the same oil?). And if nothing else, it could be fun to drop in on a nice day and chow down with a basket of fries on the back patio and relish some quiet like outdoor eating area in the far out avenues. Nov 5 weekly food news nosh and notes....and pumpkin week! !